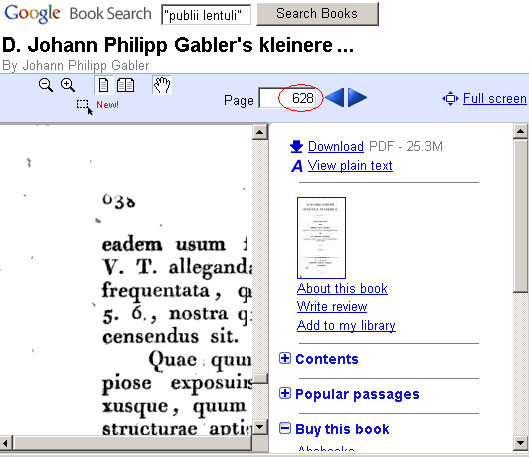 This page shows exactly how I found the text of the letter of Lentulus on Google Books. The images have been manipulated to keep all the information together in a compact size; but no new information has been invented. Also, please be aware that the exact results may have changed between the time of writing this page and the time the reader decides to duplicate my results. I have circled both the phrase I was searching for (number 1 above) and a Google suggestion for a different phrase (number 2 above). Please notice that I used quotation marks around these words. 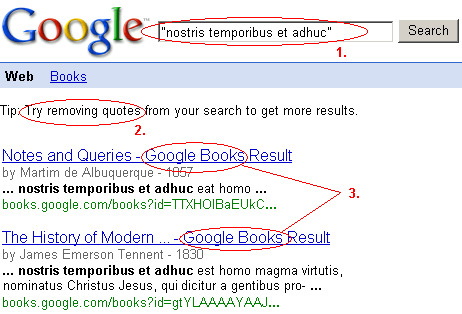 Without the quotation marks, Google would search for any book containing either publii or lentuli. With them, Google searches only for the exact phrase publii lentuli. Also notice that I did not use capital letters. I could have, but Google searches are not case-sensitive. Finally, let me point out that Google does not know what language it is searching in. 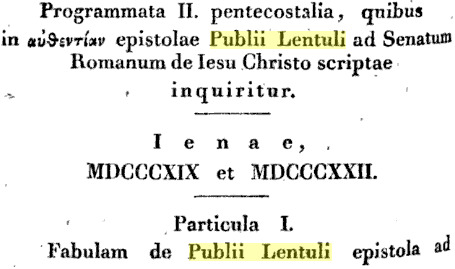 The software has no idea that Publius Lentulus is a Latin name, nor what the genitive of that name would be; it is just matching up letters in the right order. We can therefore safely ignore the suggested phrase, since Google is merely parsing the term publii as a possible misspelling of public. I checked both of these results, and indeed several others from further down the list, but it was the second that gave me what I wanted, the text of the letter itself. Remember the page number advertised in this second result, page 628, for later. I like to do this in order to keep the original results page handy. If you are using a more modern browser you can open the results in a new tab instead, if you prefer. Notice that the link took me right to page 628, which is the page advertised on the search results. Several pages of commentary after this title (each new page accessed just by scrolling down some more) came the Latin text of the letter. 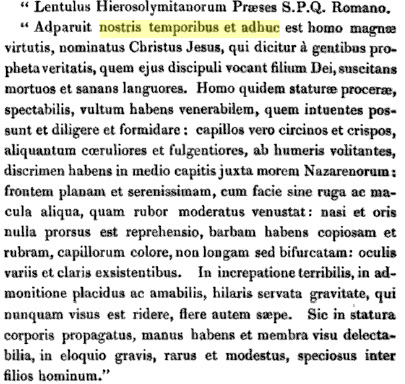 It began with the Latin phrase apparuit temporibus nostris et adhuc. Unfortunately, the letter, which is quite brief, was spread across several pages because of the very lengthy footnotes on each page. 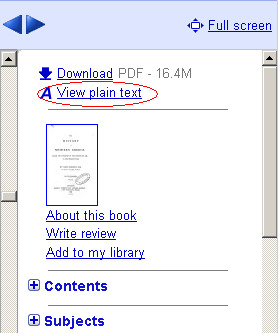 I knew I ought to be able to find a better example of the letter somewhere on Google Books. I have circled my search phrase (number 1 above) and the standard Google suggestion to remove the quotation marks (number 2 above), a suggestion that I routinely and cheerfully disregard. This search produced no results (for reasons which will become clear shortly); the solution is not to remove the quotation marks (though that may work at times) but rather to cut the phrase down a little bit. I have circled my new search phrase (number 1 above), the familiar Google tip (number 2 above), and the results (number 3 above); these were the only search results, and both were from Google Books. This meant either that I would have to be satisfied with one of these two results (and in this case it turned out that these two held what I was looking for) or that I might as well search Google Books itself, since not all Books results are displayed in standard Google searches. Note again that our phrase of choice is highlighted. And now we see the reason for the failure of the phrase that included the word apparuit; this text offered the unassimilated form, adparuit, with the d still showing. 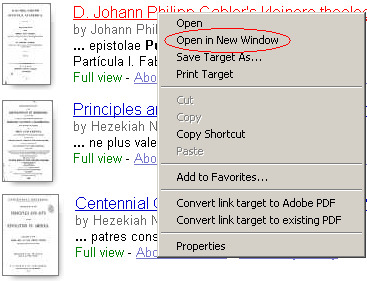 Another option is to download the entire text as a PDF file. Lentulus Hierosolymitanorum Prseses S.P.Q. Romano. " spectabilis, vultum habens venerabilem, quem intuentes pos- . Often the text will require editing; scanning technology is not perfect, and some letters or spaces will come out wrong. Notice, for example, that the � ligature in line 1 has come out as se instead of ae and that the words propheta and veritatis in lines 3-4 have been run together as one word. But it may still be easier to modify an existing digital text than to type it up from scratch. These scanning errors can also make it difficult to find the text on Google Books, since it is the plain text, not the image files, that Google is matching to your phrase search. This is another reason why it is important to try different phrases of different lengths. This takes practice; if the phrase is too short or too common, you will get too many irrelevant hits, and, if the phrase is too long, you risk including a word that was not scanned properly and thus missing out on relevant results altogether. At any rate, I sincerely hope that this little ecourse inspires others to find more texts on Google Books and present them in other venues on the web.